With new legislation such as GDPR, the lettings fee ban, mandatory CMP and regulation, our third edition of Professional Risk Associated With Property Professionals discusses the ever-evolving risks attached to running a property services business and how to best anticipate and mitigate risk going forward. The new legislation being introduced is designed to help provide the consumer with more protection and comes with penalties for those who do not conform. We are all aware of GDPR, we also now know a lettings fee ban is going to be introduced and CMP is to be made mandatory. For those who do not comply, GDPR comes with financial penalties of up to 4% of turnover or €20m, whichever the higher, for the most serious breaches. The Consumer Rights Act requires agents to display clearly, online and in their office, which redress scheme they are part of and whether they do or do not form part of a CMP scheme. Trading Standards are entitled to impose fines of £5,000 per breach which could mean £20,000 if an agent does not disclose their redress scheme in the office and online and the same for CMP. In our experience, having viewed many agents websites, under half of agents in England do not display their CMP position clearly and would therefore be liable for a fine if trading standards were to visit. It is important to note that whilst most agents will have a PI policy, it will not cover the policy holder for fines. Whilst a PI policy does not cover fines, subject to policy terms and conditions, it should respond where a claim is brought by a third party who has suffered a loss as a result of the agent’s breach. Please also note some cyber liability policies are picking up GDPR fines, however this may not last long. 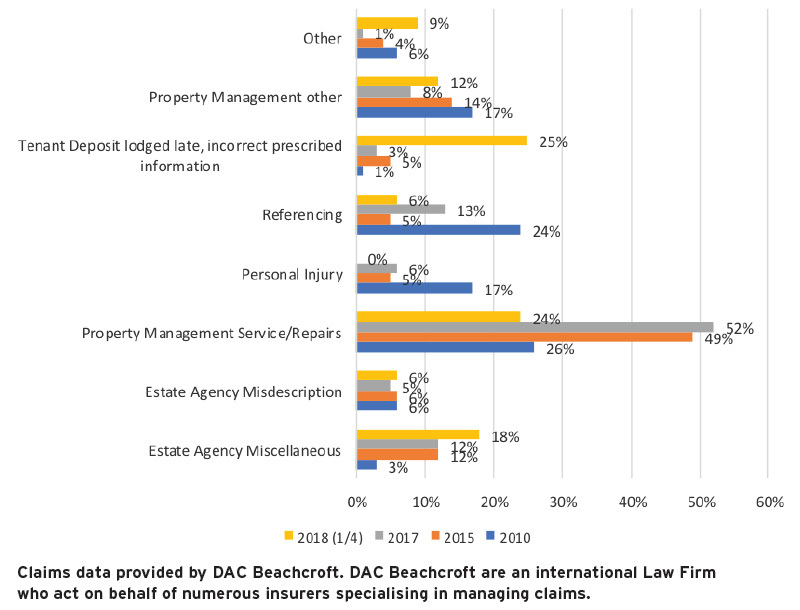 The below chart shows interesting changes in claims frequency since 2010 categorised in to different activities. Property management claims continue to show consistent frequency, however the most notable development in the last six to twelve months comes from the surge in claims due to deposits not being lodged on time and prescribed information being issued incorrectly. In only the first quarter of 2018 DAC have seen 25% of their claims come from deposits not being lodged on time. This is up from 3% for the whole year in 2017. It has been well documented that the courts can award up to three times the value of the deposit where a deposit has not been lodged on time, therefore tenants are being much more attentive and especially if prompted by a No Win No Fee law firm. It’s interesting to also note the reduction in personal injury claims which have typically been associated with No Win No Fee law firms. Perhaps they have switched allegiance! The above chart does not include cyber claims as cyber liability is not typically included under a PI policy, however it is important to note the increasing threat of cyber liability and especially now GDPR has come in to force. Europol – the government agency responsible for monitoring crime across Europe – announced that cyber-crime was the biggest threat facing computer users. The PwC’s Global Economic Crime Survey (GECS) revealed that cyber-crime is now the most common type of fraud for businesses in the UK. Results found that 50% of UK businesses were victims of cyber criminals in 2017 therefore one in every two UK businesses suffered a breach. The survey revealed 49% of all UK fraud related to cybercrime, whilst globally it accounted for 31%. Cyber criminals are becoming increasingly sophisticated and would appear to have switched their attention from large international corporates to SME’s. The reason being SME’s are, typically, more vulnerable with weaker defences which make it easier for the hacker to penetrate IT systems. The Cyber Liability insurance market is changing constantly. Policies are currently widely available, however vary in price and coverage. We recommend your cyber policy includes social engineering claims, cybercrime cover, business interruption, instant response cover and brand reputational damage protection. Consumer protection is important and should be encouraged, however we are seeing an increasingly worrying trend where claimants are pursuing agents regardless of whether there is any substance to the claim, in the hope insurers shall settle. Typically, the claim values are low eg £2,500 – £5,000 where going to court would cost the insurers more in defence costs therefore they settle out of court. We have already highlighted above the increased frequency of claims being brought against agents for failure to lodge deposits on time. Letting agents should have written and documented controls and procedures in place which are followed by all staff responsible for collecting deposits to ensure deposits are lodged and prescribed information issued within the required thirty day time frame. Check what system you have in place for lodging deposits. Can you improve your system through better diary systems, introducing internal audits, client account reconciliation? We are seeing many agents choose to remove the risk entirely by outsourcing their client accounting functions. Check your policy is accurate and reflects the instructions given to the broker. Review data processing and security procedures to ensure GDPR compliant. Admit liability or agree to a settlement without insurers authority. There is no doubt we live in a litigious society where there is an ever-increasing claims culture. Advanced technology and extensive choice has influenced the consumer to become increasingly demanding. With all the new legislation coupled with the assistance of social media, online claim centres, chat rooms, blogging, and No Win No Fee law firms, the claimant is far more educated and aware of their rights. Whilst it is impossible to totally remove the risk of a claim being brought, there are measures and controls that can be implemented to help mitigate potential threats and we hope the above paper provides some useful guidance.